Growing Up Geeky: Geeky Find Friday - Baby can spit up on subtraction! Geeky Find Friday - Baby can spit up on subtraction! I usually accomplished both. Yes...I have always been this geeky. 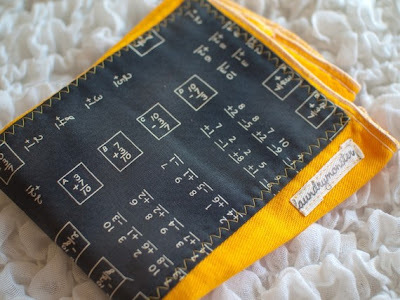 A very cute blackboard print with math equations is zig zag stitched to a hand dyed school bus yellow burp cloth. Great for math geeks, and the color couldn't be brighter. I love that some of the print looks like little flashcards. If you think baby will love Math, this is perfect! If you think that he/she would rather eat brussel sprouts covered in cod liver oil, than do long division, then this might also be perfect...that is, for letting baby spit up on.